It is said that a blues artist has to die before he gets just recognition. Such a maxim can hardly be applied to Jimmy Reed but there is a certain irony of circumstance that could well make it seem so. Some while ago I arranged with DJM to release a set of reissue albums to present Jimmy Reed's recording career chronologically in recognition of a once prolific, popular and important bluesman. As fate would have it Jimmy died unexpectedly in Oakland, California on August 29th, 1976. What was to have been a series acknowledging the Big Boss Man's role in blues history has, through a sad circumstance, become a double gatefold memorial album. Jimmy's last few years were dogged with personal problems. He had seldom been seen since 1971 though, fortunately, between July 1973 and October 1975, LIVING BLUES magazine in Chicago managed to conduct a lengthy and frank interview with Reed (extracts from which are used in this note), in which he sounded overtly optimistic yet cautiously philosophical about the future. "So, I'm gonna try it again anyway, I got a feelin' if He(God) don't want me to make it, then He ain't gonna let me make it..." Prophetic words indeed. Mathis James 'Jimmy' Reed was born at Dunleith, a plantation community near Leland, Mississippi on September 26, 1925 (not 1926 as was thought for many years) to Joseph and Virginia Reed. We have only the barest outline of his childhood; he was the youngest often, received three years schooling, and learned to sing at the Pilgrim Rest Baptist Church in Meltonia, Mississippi (a small township where the Reed family had moved after leaving Dunleith to take up another farm tenancy). It was there that, as Eddie Taylor recalled, the pair of them first met, "Yeah, from kids in Meltonia... I taught Jimmy how to play guitar... Jimmy learned harmonica on his own up there". Reed had taught himself harp initially for his own amusement, having been inspired by the King Biscuit Shows on Helena, Arkansas radio station KFFA. At fifteen he left home for Duncan, Mississippi to stay with an older brother and farm for a 'Mr. Mac' but, like most people of his age, soon tired of rural life. In 1943 a very green country lad ("I didn't know nothing... I couldn't even spell my own name") found himself in Chicago only to be drafted into the Navy. His nautical career was short. "They give me an honourable discharge just like that... and I hadn't been in there but a year and twenty-three days out of the whole thing," remembered Reed when recalling his various (unintentional) draft dodging illnesses during basic training. On discharge he returned to Mississippi where, on May 25 1945, he married a girl named Mary Lee Davis (later to become Mama Reed on record), settling down to a farmer's life yet again. Following three years of barely scraping a living from the land which, as a consequence, created matrimonial tensions, he once again took off in the direction of Chicago, this time, however, settling in Gary, Indiana where he found employment at the Mould Valley Foundry. Encouraged by a meeting with one-string guitarist Willie Joe Duncan (who later recorded for Specialty as Willie Joe and his Unitar) Reed, looking to music as a possible future wage-earning alternative, began playing the Gary night-spots, having rigged up a harmonica rack around his neck to enable him to play guitar and harp together. At the time he regarded this method of jointly playing these instruments as unique. "I hadn't never seen nobody play both of 'em at one time together like that. I was the only somebody I had seen do that." Perhaps, in passing, it should be said that, as early as 1924, Sam 'Stovepipe No. 1' Jones had employed this technique as well as Robert Lee Mc Coy during the thirties and Joe Hill Louis in the fifties. In 1950 Jimmy Reed decided to base himself in South Chicago, finding work at a number of factories. At weekends he journeyed to Gary in order to gain experience from playing with blues club regulars like John and Grace Brim, Eddie Taylor (with whom he was reunited) and a drummer known to Reed as A.B., and whom he identified as Albert King. Three years were spent gigging in this fashion. They were three years well spent for, he came to the notice of deejay Vivian Carter and record shop owner Jimmy Bracken who, although primarily interested in Eddie Taylor, nevertheless arranged a hasty audition for Reed in June 1953, at which four songs were taped. There has always existed some debate over when exactly Jimmy Reed was first recorded. The VeeJay files give the date as December 29, 1953 but as has been pointed out by John Broven this was probably an arbitrary date. It has been confirmed by Reed in interview many times that "High And Lonesome" was committed to tape that June at a time when Carter and Bracken hadn't yet formed a company, and he has never suggested that he re-recorded the number at any later session. Also, since Reed remembers the Spaniels (then known as Pookie Hudson and The Hudsonaires) as being recorded the month before he cut "High And Lonesome" (they were, in fact, recorded on May 4th) it can safely be assumed that June was the date. As has been previously mentioned, when Carter and Bracken made these recordings they did not own a company to issue them, so the masters were leased to Chance for release. It was only after "Baby It's You" by the Spaniels began to have an impact on the record buying public that Vivian and Jimmy realised they were missing out, formed Vee-Jay (the name coming from the initials of their Christian names) in July 1953, rescued the masters from Chance and issued them as the Company's first releases, finally sealing their partnership by getting married in January 1954. As for Jimmy Reed, his recording career got off to a very doubtful start, failing with his first release, "High And Lonesome" and doing just as badly with the second, with the result that he was ignored by Vee-Jay for almost a year in favour of their hit making Spaniels. Then, for no apparent reason, in late '54 "You Don't Have To Go" was released coupled with the instrumental "Boogie In The Dark" (items recorded the previous year). Within months the record was in the charts. At last Jimmy Reed had managed to achieve what he had striven for since first reaching Chicago: to earn a living from music. The success of this release started him on the road to a prolific recording career, during which he had 14 entries in the R&B charts and 12 in the pop Hot 100 - the most outstanding chart career of any 'straight' blues artist. "You Don't Have To Go" set the pattern for most of his subsequent songs - lazy, hypnotic, four to the bar rhythms punctuated by treble register harmonica playing, carrying the slurred lyric with strange urgency. This was to become the much used 'Reed Sound', which is evident on nearly all the tracks presented here. There were departures,however. Listen for example to "Roll & Rhumba"with its Latin beat; the brisk, up-tempo instrumental"Boogie In The Dark" which includes a flash of slide-guitar towards the end; or the enigmatic "Odds And Ends" featuring a violin played pizzicato. The violinist is simply given in the standard discography as 'Levinsky' but subsequent research seems to show that Remo Biondi, who played lead guitar on the plaintive "Honest I Do" at this session, took over on violin. Biondi re-emerged at a December 1957 session, recording with Reed right through 1958, and it's his lead guitar that can be heard on the beautifully simple "Caress Me Baby", which all but hypnotises. 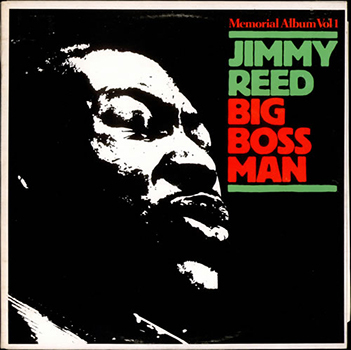 A noticeable departure from Reed's usual 'laid-back' approach is "Big Boss Man", a Willie Dixon song, sung very much in the style of his Chicago blues contemporaries-it is also unusual in having a vocal chorus from Mama Reed. The early sixties were a busy time for Jimmy Reed. Outside of his studio commitments (which will be discussed in later albums) he was in great demand on the coffee-house circuit at home and in the concert halls of Europe, where a blues/R&B revival was under way. For reasons that can only be surmised, but indirectly having something to do with his being an epileptic, Reed began to take much greater refuge in the bottle with the result that he became an unreliable, erratic performer who lost (or totally missed) bookings. When Al Smith took over as recording director of Vee-Jay in 1964, it could be said that Reed was already a Company has-been. In 1966 Vee-Jay 'ceased trading' but as a final gesture of goodwill, Al Smith took him along to ABC-Bluesway. Over a period of years Reed cut four albums, mainly of remakes of his Vee-Jay hits. The end product, by and large, is perhaps best left undiscussed. Probably the greatest achievement of Jimmy Reed's last years was his 'comeback' performance at the1973 Ann Arbor Jazz and Blues Festival, which received unexpected praise from the critics; but most agreed that Jimmy Reed, although now over his problems, could never regain the zenith here ached between 1953 and 1960.Perhaps it is appropriate that this, his Memorial Album, showcases the music of Jimmy Reed's finest years.